Renault’s investment in electric vehicles is already paying dividends and the automaker said today that its profits from EVs will rise significantly in the next five years, which is in big contrast to rivals. 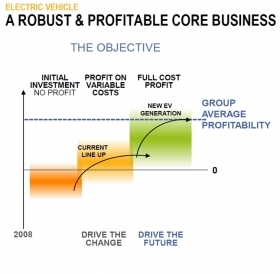 Renault EV boss Gilles Normand today showed a slide that detailed the company’s progress toward EV profitability (see below). Since starting its Drive the Change plan in 2011, the French carmaker moved from losing money to making a small profit “on variable costs” with its current four-model range. 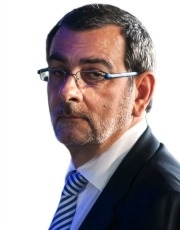 Normand said Renault’s next generation of EVs that come during its new Drive the Future plan, which runs until 2022, will generate an operating profit that exceeds the group’s 7 percent margin target. Normand said the key to reaching this will be the debut of the new CMF-EV platform, which will be shared with alliance partners Nissan and Mitsubishi. “With CMF-EV, we will be able to cover from the B [subcompact] to the D [midsize] segment, offering different size of batteries for different customer needs,” Normand said. Vehicles on the new CMF-EV platform will share 80 percent of their electrical components, thus boosting economy of scale. That is why Normand expects the battery the cost per kilowatt hour to decrease by 30 percent and e-motor costs to fall by 20 percent. In addition, since CMF-EV is an alliance platform each automaker will reduce its r&d investment by 40 percent and production cost by 30 percent compared with going it alone. The new platform will also help Renault double its EV lineup in Europe to eight models, said the company, which claims to be the region’s top seller of EVs with a 25 percent share, ahead of Nissan with 22 percent. While both Ghosn and Normand were happy to talk about EV profitability they avoided any mention of a volume target. Perhaps that is because Renault-Nissan badly missed Ghosn’s previous targets for EV sales.